Rated thumbs up by some of the toughest critics! 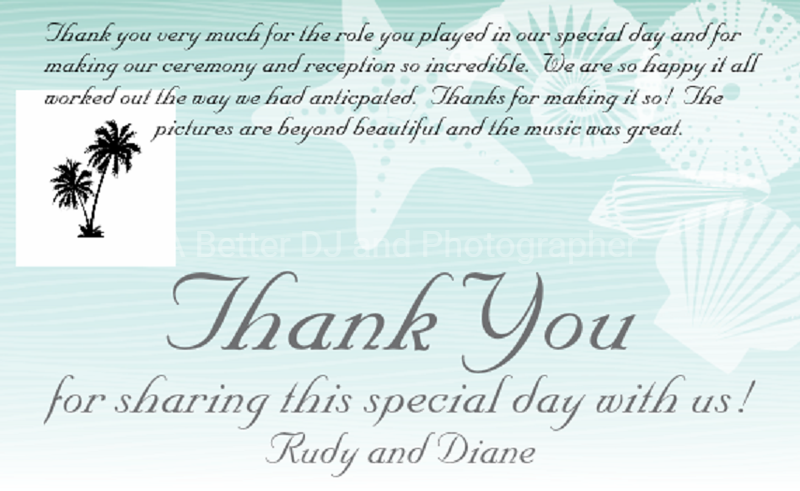 All testimonials are from performances by A BETTER DJ AND PHOTOGRAPHER, National Weeding Photography, and National Wedding DJ staff from actual clients. Their photos can be found on our various websites. We stopped actively publishing these long ago and these are just a sample of the hundreds we receive. We have done over 12,000 events and had 1 complaint that wasn't even our fault! We do not solicit reviews from our customers but some feel the need to let us know what a great job their DJ and/or photographer did for them! Why pay more for your wedding DJ or wedding photographer and not get results like this? We have thousands of great reviews so we no longer post them as of 3-29-14! Rina from A BETTER DJ AND PHOTOGRAPHER and her husband Michael were great. Rina took the photos and Michael was the DJ. You definitely won't go wrong using them for your wedding. Here are some photos from our wedding and I can't wait to see the rest. I love what I've seen so far. The shower of rose petals was definitely an awesome touch that we both loved so much. — with Barclay Sands. Hi! I just wanted to thank you for helping make my daughter's Sweet 16 party so great!. Both the DJ and the photographer were very professional and did a wonderful job. My daughter said she had the party of the year and all her friends had a great time! It will be a party and night she will never forget. We cant wait to see the pictures! Micheal and Rina-Marie are amazing and gave my husband and I so many amazing pictures!! Micheal also was our DJ and my guests walked away saying it was the best wedding they had ever been to. LOVE LOVE LOVED them!!! 11-24-12 "I booked my wedding with A Better DJ about 5 months before my wedding. As the wedding got closer, I got more and more nervous that I had not met with my DJ or photographer. Both Michael and Rina did a great job of keeping me calm. My wedding day came and everything went perfectly. My photographers were amazing and ones that I could never have afforded without A Better DJ. They took photos during my ceremony even though the contract was just to include video, they came an hour early and left an hour late, listened to what I wanted and took some beautiful pictures. It took my family and I hours to go through all the pictures that were taken because there were so many (and that's after all the closed eyes, blurry, etc pictures were deleted). Though I was nervous, everything worked out wonderfully! I would highly recommend using A Better DJ to get great service, quality professionals and an awesome price!" Hello Michael & Rina Marie, I want to let you know that Carlos and I enjoyed every moment with Milton. He was an awesome and fun photographer. We would like to know, do you know exactly when will we be receiving our pictures? I want to send a quick note to tell you how great your DJ's were last night. These guys were very professional and everything went off exactly as planned and couldn't have gone better. It really was top notch. I'd be happy to recommend them to anyone and you are free to forward my email address to anyone asking for a reference. These guys really made this a great and fun wedding. I just wanted to send you a quick email to thank you guys for the wonderful photographer, Bill, he was awesome, I received an email to introduce himself and asked questions on how I wanted the pictures handled. Like I said before Bill was a great guy and would definitely recommend him to anyone who is in need of a professional photographer, and me myself would hire him again if ever in need. Ragy and I both are saying thank you so much for everything, you guys really made our day special. We will be for sure recommending you to everyone. You guys did exactly what we wanted and got everyone dancing a having a good time. Thank you again and can't wait to see everything! Update: 6-5-12 We love the pictures. Especially the ones with our bridal party. They are amazing! Thank you so much! Hello! Thank you for making our special day so wonderful!!! Can't wait to see the pictures. What is that website again? Hey just getting back into the swing of things thought I'd get in touch. I would like to say how much we enjoyed your service, you both were amazing. Thank you much for your efforts and professionalism, I will defiantly refer you and or use you again. Thanks so much for your services! I really couldn't have had a better dj or photographer! It was so amazing! we look forward to using your services again. please let us know when the pictures will be up and where? Hello Michael and Rina I just wanted to say thank you for everything u did at our wedding you two made it extra special and brought everyone closer together. I just got your voicemail this morning about verifying my address so you can send the pictures its ********* Thanks again for everything and making our special day truly more special and intimate. Thanks rina! I finally had time to look at all my pics and they are amazing! I love them! My wedding was perfect thanks to you and Mike! Kristina 11-21-10 I can not thank you and Mike enough for the awsome job you did with the pictures and the DJ'ing. 11-6-10 To all the vendors and professionals who worked Mr. and Mrs. Gatto's wedding, I want to thank each and every one of you for coming together and producing a successful event for Tessa and Matt and their family and friends. I look forward to working with you in the future! DeAnn Houck All Occasion & Event Planning Thank you, Yeah for some reason the computer at work would not pull the pictures but once i got home they were there. Thank you. I am so excited to see the other photos!!!!! Beautiful!! 2-1-10 Wanted to thank you all! HAD great time, hope it wasn't to stressful for you all trying to get people moving, I told you! Pictures taken were wonderful, they did great too. please let me know when the pictures will be posted, already have people asking me...ALSO am I getting a hard copy CD of them mailed to me? or how does that work? I will wait to hear from you all! 12-06-09 Hi Michael, Sorry for the delay in getting this message to you.Just wanted thank you for the excellent job you did at our Christmas Party. You and your lovely wife made our Christmas Party one that will be talked about favorably by everyone for years to come. Your performance as a DJ was excellent.The group had a really good time. I appreciate all you did to make our annual Christmas Party a tremendous success. 08-15-09XPLA HI MICHAEL, THIS IS BARBARA. COULD YOU PLEASE WRITE AND EXPLAIN HOW TO GET ON YOU-TUBE TO SEE THE WEDDING PICTURES? I WOULD REALLY APPRECIATE IT! THANKS FOR A GREAT JOB AT THE WEDDING AND PLEASE THANK YOUR WIFE TOO! Hi Rina Marie, Everyone is still talking about the wedding and reception!!! When will the pictures be up on the web? Suzie is leaving next week for Uraguay and wants to bring the pictures to Carlos's parents. Get ready for another wedding!!!! Scott proposed to me the other day!!!! But we have to pay off Suzie's wedding first. Talk to you soon, Sandy Rina Marie, Thanks so much for all your help and input with plans for Kim and Darrell's wedding. The details were starting to get to me so I really appreciate everything you've done. HI MICHAEL THIS IS BARBARA BAZLER AGAIN!! COULD YOU PLEASE WRITE AND EXPLAIN HOW TO GET ON YOU TUBE TO SEE THE WEDDING PICTURES I WOULD REALLY APPRECIATE IT THANK YOU FOR A GREAT JOB AT THE WEDDING AND PLEASE THANK YOUR WIFE TOO. ø¤ºABETTERDJ º¤ø,¸*¸,ø¤º YOU ROCK! º¤ø,¸*¸,THANK YOUº¤ø,¸*¸,ø Hi Mike, Everyone had an excellent time at the party, thanks to you and your wife!! Thanks again for everything. I will definitely recommend you!! The link above gives you several options for the cassette converter deck. 12-09-2007 and never enjoyed a company Christmas party as much! You people were great. I was wondering when the "PIX" would be available for viewing? I know it takes a while----- was just wondering. Thank you for a great time. Just a party goer. Today, 2:24 AM EDT Watch This is an amazing couple. They have an infectious vitality about them and bring a wealth of joy to everything they touch. Without hesitation, I would highly recommend them. You can get results like this by calling 321-412-3878 right now! User rating: 5 of 5 stars "The True Definition Of MC And Host!" Kunsistent-C/ Full Fokus Entertainment Winter Park, Florida January 18, 2007 My name is Kunsistent-C and I have been in the Entertainment Industry professionally for more than a decade. You can google my name if you need to see my credentials. This dynamic duo is the one-two punch for any celebration, regardless of the event. He is the most energetic MC you will find for any of your event needs. She is the beautiful hostess you picture in a movie. Never a dull moment. Never dead air! Their parties and events keep moving the entire time from begining to end. When the party is over, it continues in your head for weeks long after the music has faded. I still hear his voice, and picture her face as if the party is still going. I could break down their skills and integrity, but that would take forever. If you're looking for someone who can take total control of your event so you can relax .... these are the people to get it done right the first time! User rating: 5 of 5 stars "Best Fun " Tim Smith Sanford,Fl January 11, 2007 Home - A BETTER DJ & KARAOKE HOST Home - A BETTER DJ & KARAOKE HOST Home - A BETTER DJ & KARAOKE HOST Michael and Rina Marie are both high energy and so much fun to be around. I get out to see their shows whenever i can ...lots of fun and group involvement. Don't hesitate to call them ....you will have the best time. User rating: 5 of 5 stars "Outstanding DJ's" firescubadiver Longwood, FL January 10, 2007 Home - A BETTER DJ & KARAOKE HOST Home - A BETTER DJ & KARAOKE HOST Home - A BETTER DJ & KARAOKE HOST Home - A BETTER DJ & KARAOKE HOST Michael and Rina Marie put on the best DJ and KARAOKE show I have ever been to. These two are by far the best people to have as DJ's and or Karaoke hosts I have ever seen. They get everyone involved and all have a great time partying. 5 of 5 stars "Wild things" jack florida Cocoa beach, January 19, 2007 GREAT Music, had everyone up on their feet dancing all nite, Plus great with the Mike... 5 of 5 stars "great times had by all!!!" maggieswishes OH MY STARS! posted by maggieswishes Feb 26, 3:28 AM EST Watch You guys made the party happen! Warm huggies 2ya both! No replies yet | Post a Reply out of found this comment valuable.